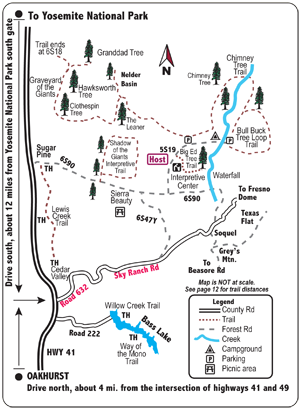 From the south exit of Yosemite National Park: Drive south 12 miles and make a left turn onto road 632 – Sky Ranch Road. Coming from the south: Drive about 4 miles on Highway 41, north of Oakhurst, CA, and make a right turn onto road 632 – Sky Ranch Road. Drive for 7 miles. Turn left on dirt road 6S47Y, and drive about 1 mile. At the fork, turn left for Shadow of the Giants trail, 1 mile. Turn right for campground and other trails. Then turn left at 5S19. The campground/trails are about 1 mile from the fork.